-There is a general shortage of grafted planting materials of improved and higher yielding varieties in many areas. Farmers often use inferior seedlings obtained by germinating mango seeds from indigenous varieties. Such ungrafted trees take much longer to bear fruit. Whereas grafted trees begin to bear fruit within 3 to 4 years, ungrafted trees will take at least 5 years to bear fruit, depending on the growing conditions. 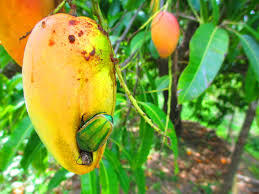 Mangoes have many devastating pests and diseases, which can result in total yield loss. Major pests include the fruit fly (Bactrocera invadens), seed weevil (Sternochetus mangiferae) and mealy bugs (Rastrococcus invadens). Diseases like anthracnose and powdery mildew are common in almost all mango growing areas. In many areas, mango trees are left to grow so big that pest and disease management, harvesting and other field operations are difficult to implement. Except in big or commercial farms, mango trees are normally scattered around the gardens, ranging from 2 to 100 trees per household. This scattered nature makes mango a commonly neglected crop in terms of management, but becomes important only during the harvesting season. Fruit damage is a common problem as a result of poor pest and disease management and the poor harvesting practices. Also, a lot of fruit is lost after harvest, especially during the peak seasons due to the limited capacity to store and process fruit. This is further worsened by the poor roads and transport infrastructure to markets. depending on the local conditions. During this time, most areas are harvesting and so the local markets are saturated and, therefore, offer very low prices, which may not even cover transportation costs. For more information about mango farming in Kenya, visit our offices. In addition book your seedlings today!! Are these the short mangoes harvested in kangundo and ukambani areas on Kenya? If so o would like to have them in my farm in mombasa mwakirungi area at least 20 trees would be food for me please give me information on how to do. hello, we have various varieties of mangoes you can contact us on 0723662773 to order we will organize how they will be delivered.